Project scheduling is an integral part of managing projects and always requires collaborative input from the team. Online project collaboration tools enable teams to enter tasks and provide real-time updates wherever you work. Each of these popular project management and collaboration tools gives you plenty of flexibility to add Gantt chart functionality to your team's work processes. Is always synced and up to date. Abundance of features is overwhelming at first. One of the pricier solutions. TeamGantt is an exclusive online Gantt chart for managing an entire project schedule. The Gantt chart's interactive workspace is where you enter tasks. As tasks are managed on the Gantt chart, you can add team assignments. Task views can be filtered to show work in progress and due dates. The project team can edit and share the Gantt chart with others as well as add notes, either attached to tasks or sent out by email. Documents and images can be attached to tasks and downloaded to view. The tool provides ​an easy way to see where you stand with hours, project deadlines and resources in real time. Ideal for projects with very large teams. 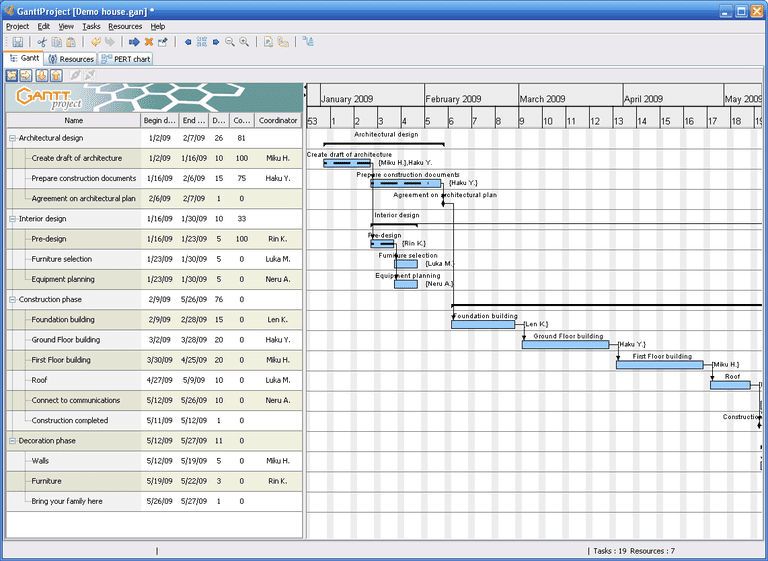 ProjectManager offers a Gantt chart option that is easily customizable. You start by adding tasks and due dates and then assign team members to tasks. The team can access the Gantt chart online for real-time updates. You can customize the Gantt chart any way you like, and your team members can attach files and add comments or notes online. ProjectManager also offers advanced features for use with your Gantt chart if you need them for complex projects. Large selection of plugins available to expand functionality. Permits a high degree of customization. Project teams using Atlassian JIRA for software development can utilize the Gantt chart plugin. Software issues and dependencies can be displayed on a project tab panel or utilized through Gantt-Gadgets for the dashboard. You can manage the visibility of critical paths and each version of single or multiple projects. Additional features include automatic rescheduling of tasks, subtasks, and dependencies, as well as enhanced linking for multi project dependencies in test and release management. Export capability is provided to deliver project updates for management presentations. Reasonably priced plan allows for unlimited users. Binfire’s online project collaboration tool includes a standard interactive Gantt chart and work breakdown structures to six levels. You can apply changes in the project’s view to flow to the task levels, which are automatically renumbered. As your project schedule changes, you can easily extend or shorten tasks on the fly as well create or remove dependencies. Great support for mobile devices and third party integrations. You have to pay extra for certain features even after purchasing a monthly plan. The reporting feature needs improvement. Wrike’s integrated project management application offers an interactive Gantt chart with two views. The Timeline view expands individual projects and task management, including drag and drop functionality and auto-updates. You can set dependencies in real time with simple adjustments. The Resource Management view helps manage team schedules and communications. Manage the resources and track performance using this workload view. Recalibrate on the fly when needed. Projects are updatable from iPhone and Android mobile apps.